With Cox on vocals and Safiruddin on piano, these two very talented musicians perform songs from The Tony Bennett and Bill Evans Album released in 1975 and their follow-up album Together Again released the following year. Ben Cox is an outstanding Jazz singer. He initially studied classical piano and trumpet but his love of jazz singing led him to London and his studies at Guildhall. Since moving to London he has taken his opportunities to perform with internationally acclaimed jazz musicians and is a member of the A Cappella group 'Vive', who recently performed to great acclaim at the Edinburgh Fringe. 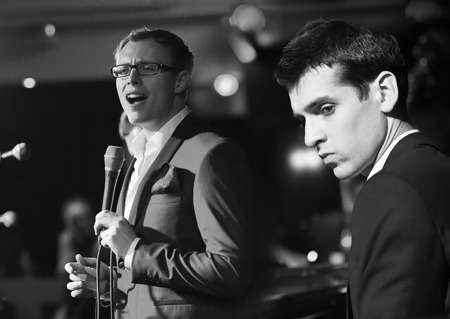 The Ben Cox Band have a rich history on the jazz scene, playing the best jazz clubs up and down the country. Jamie Safiruddin started playing the piano at the age of 8 on a baby grand that had been a family heirloom since the start of the century. As a student he discovered the exciting electric funk and fusion of Herbie Hancock, The Yellowjackets, The Meters, Weather Report, Chick Corea and Tower of Power. From there, it was a logical step backwards to find the origins of the music in 50s and 60s American Jazz. Jamie's professional work as arranger has recently begun to develop, including several arrangements featuring on the forthcoming Cherry Ghost album. He has also toured with the legendary Paul Heaton with 'The 8th'. With just piano and voice, explore the world of the song, inhabit the collaboration of minds and hear and breathe the stories that sparked the creativity in the writing of the songs you know and love.